I myself have never been a big fruity type pie person. However I do like them, I just don’t LOVE them like I LOVE chocolate. So when I was shopping in the market one day I was at a lost at what dessert I was going to fix for Sunday dinner. I wanted and craved something different. Something more than the ordinary. So I left the store and went home and Google away until I came upon a recipe I was intrigued by. It was something simple but yet classic. The good ole Strawberry Shortcake. This was perfect because strawberries were in season and I knew that this was going to be a good change. Besides any recipe that has cream cheese and powdered sugar in it has to be good. With a little re-mixing I made this recipe a true Porter House Original. Try it today, You’ll be glad that you did. 3. 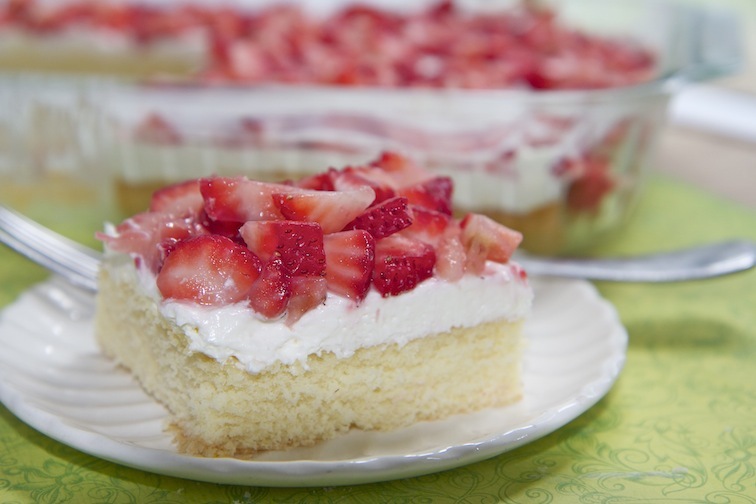 Blend soften cream cheese with powdered sugar … After the cream cheese/sugar is combined; Fold in cool whip … After everything is combined frost mixture on cooled cake ..
5. Eat and enjoy … refrigerate any leftovers ..
*CHEF’S TIP : If strawberries are not your thing (BYOC – Be Your Own Chef) and use whatever fruit you like. Happy Baking! Posted on July 6, 2012, in Lady Fab Cooks and tagged cake, cool whip, cream cheese, dessert, food, fruit, strawberry, yellow cake mix. Bookmark the permalink. Leave a comment.